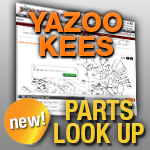 Yazoo Kees Wheels: Find the replacement wheel you need to repair your Yazoo/Kees lawn mower or zero turn. Wheels can lose tread and even begin to dry rot if they're too old. Dry rot can cause your tires to lose air pressure. So replace your old wheels on your Yazoo/Kees mower with new ones from Jack's.